Couch potatoes, please show your love by becoming a patr(e)on of the Museum! 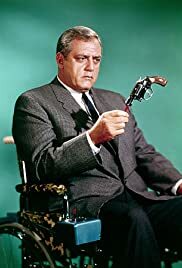 In this exhibit, join us for further wanderings through the Cop Shows Wing of the TV Museum as we take a look back at a long-running contemporary of Dragnet, the post-Perry Mason Raymond Burr vehicle Ironside. Learn what The Beastie Boys, Quincy Jones, and Quentin Tarantino all appreciated about this show, delight in what may be the most Planet of the Apes connections of any exhibit to date, and marvel at the difficulties of unloading stolen liturgical treasures. And don't forget to check out our Patreon page to learn how to support the Museum -- Patreon.com/TVMuseum!